A post-exilic (after the exile) Jewish scholar compiled material from many historical resources to chronicle the history of his people. This person is not named and remains unknown, though Ezra has been cited as a possible candidate. Whoever “the chronicler” was, he utilized official and unofficial documents to write this historical account. 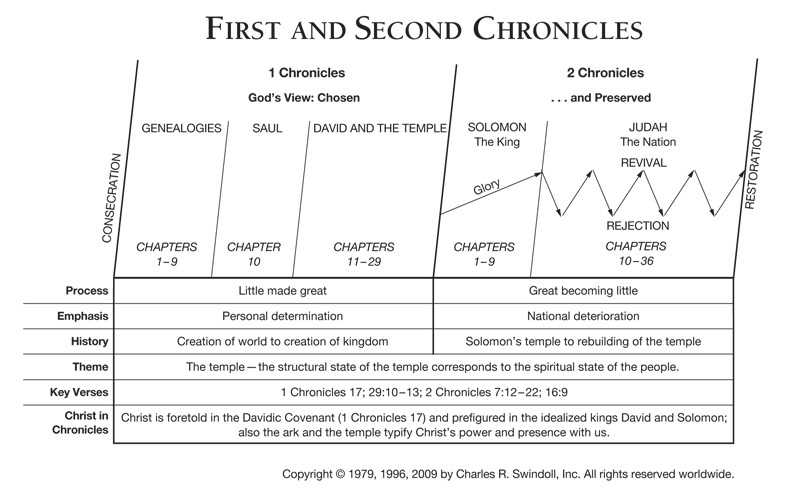 As noted earlier, 2 Chronicles originally was joined with 1 Chronicles as one book, separated into two books since about 200 BC when the Septuagint, the Greek version of the Old Testament, was translated. Second Chronicles covers the time from Solomon's ascension to the throne (971 BC) until the southern kingdom of Judah was finally carried into exile in Babylon in 586 BC. The focus of the book is on Judah. The author was more concerned with telling the story of David's descendants, who reigned over Judah, than with the history of the northern kingdom of Israel. The centrality of Jerusalem, where the temple was located, falls in line with the book's overarching focus on the priesthood as well. Again, 2 Chronicles was probably written in the fifth century BC, “following the return of a small group of Jews to Judah following the fall of the Babylonian Empire. Intent on rebuilding the temple and resettling the Holy Land, the little community soon found itself in a struggle simply to survive.”1 The Jews eventually rebuilt the temple but languished for years in their fight to reclaim the land. Against this backdrop, the chronicler portrayed Jewish history, focusing on the blessings God bestowed when leaders were faithful to His Law. WHY IS SECOND CHRONICLES SO IMPORTANT? The book opens with Solomon establishing his throne over a unified nation, solidifying his authority and squashing early rebellions (1 Kings 2). He then built the magnificent temple of God, using the plans God gave to his father, David. Six of the nine chapters devoted to King Solomon focus on the temple construction, a task reserved for him since before his birth (2 Chronicles 2–7). When the kingdom split under the rule of Rehoboam, Solomon's son, the Levites from all over Israel sided with Rehoboam and flocked to Jerusalem to continue their priestly duties (10:1–19). But a cycle of righteousness and corruption characterized the throne. Some kings were completely evil, disregarding God's Law and leading the people into sinful behaviors. A few kings, such as Solomon, started off as righteous but fell away. Others strayed but repented, such as Manassah (33:1–25). A few kings, such as Hezekiah and Josiah, were honoured with the epitaph “he did right in the sight of the LORD” (29:2; 34:2). Throughout 2 Chronicles, faithfulness was rewarded; betrayal was judged. A history lover will enjoy the numerous mentions of secular historical figures during this time period. From Tilgath-pilneser of Assyria, to Sennacherib of Assyria, to Nebuchadnezzar of Babylon, non-Jewish foreign leaders played prominent roles in the political fortunes of Judah. As it did for the Israelites, history can jog our memories. Can you remember times when God blessed you? Such memories are blessings in themselves, as well as encouragements to press on in holiness, with hope and confidence. If you are hard-pressed to recall specific times when God worked in your life, consider your devotional habits. A prayer journal that recalls prayers asked and those answered can act as your own “history” manual. God wants us to remember His works, so we, too, can praise Him for His goodness and have hope for our future! 1. Larry Richards, The Bible Reader's Companion (Wheaton, Ill.: Victor Books, 1991), electronic ed., accessed through Libronix Digital Library System. 2. Richards, The Bible Reader's Companion. 3. Richards, The Bible Reader's Companion. Find resources in the book of Second Chronicles in our resource library.